Over the weekend, my friends and I had our annual Halloween shin-dig. We usually rotate houses and this year we ended up having it outside since this house was surrounded by woods and had a great backyard area with a bonfire barrel. So, my lack of pictures is unfortunate...but due to the low lighting pretty much all night. Luckily for y'all, the 4 of us that hosted the party arrived early enough to get some photos in before we lost daylight. No one told anyone in our group what their costumes were. 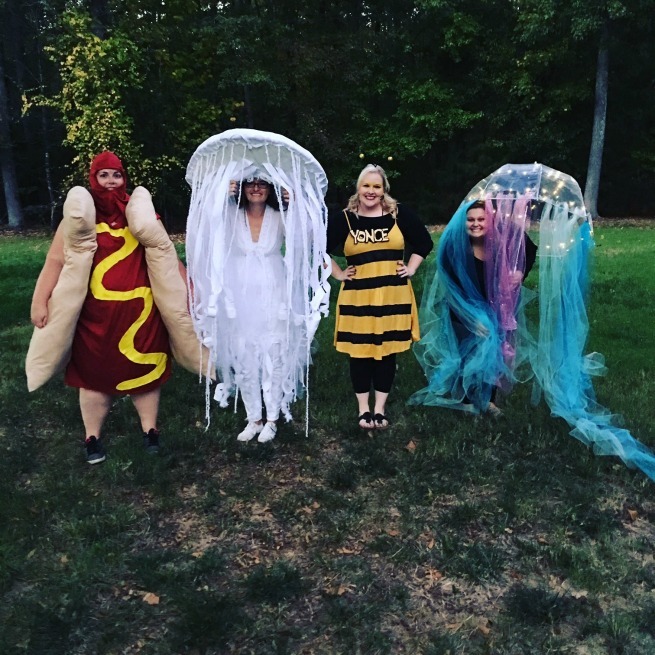 So imagine our surprise when 2 of the 4 showed up in a jelly costume!! 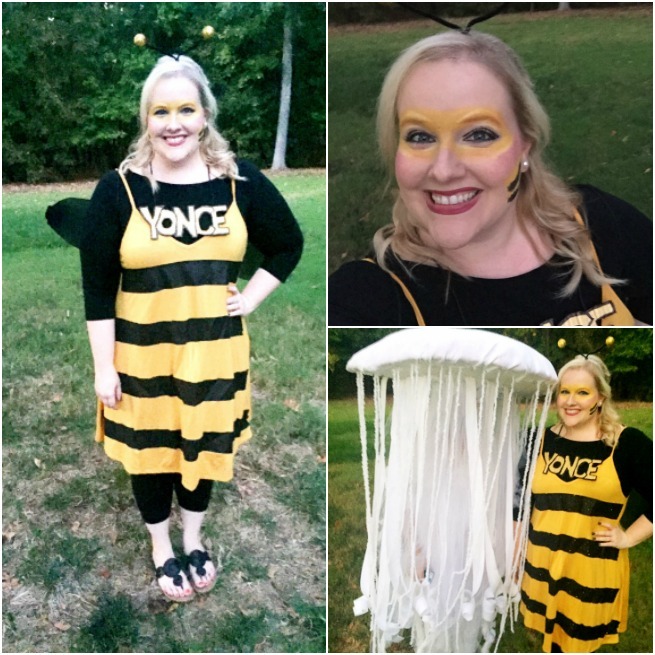 This year I decided to be punny (of course) so I dressed as a bee and wore the letters "YONCE" on a necklace. 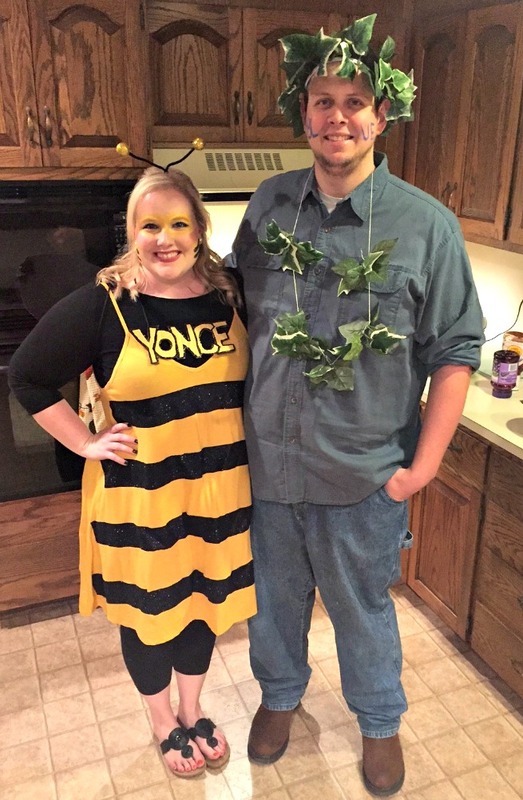 So I was...Bee-Yonce. Or Beyonce. I modeled my makeup after the bee snapchat filter (which I love). I purchased a simple yellow dress from Amazon and had my sister-in-law add the vinyl stripes to the front. I made some wings and antenna and the "YONCE" necklace is cut out of cardboard, painted and attached to some string. 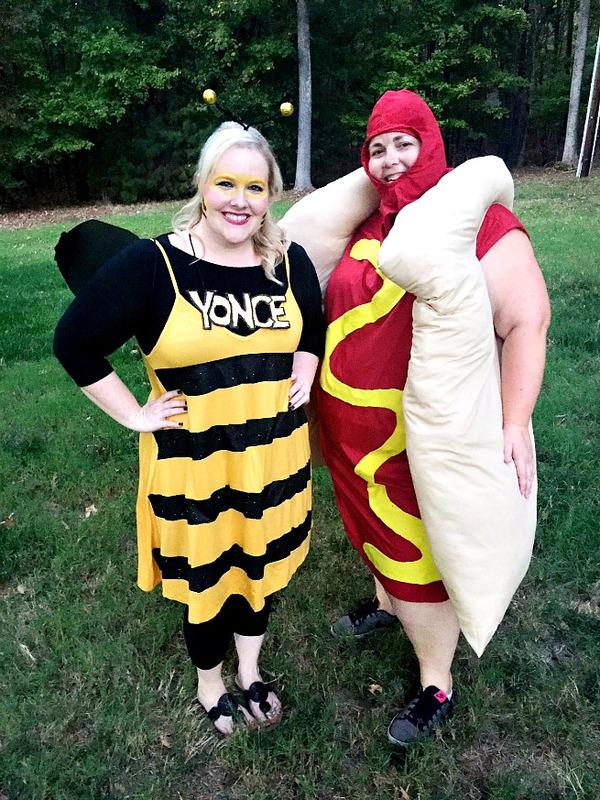 My friend Jill, easily had the best costume of the night because she MADE this amazing hot dog costume! Isn't it awesome?! I hope you all have a great Halloween and stay safe! 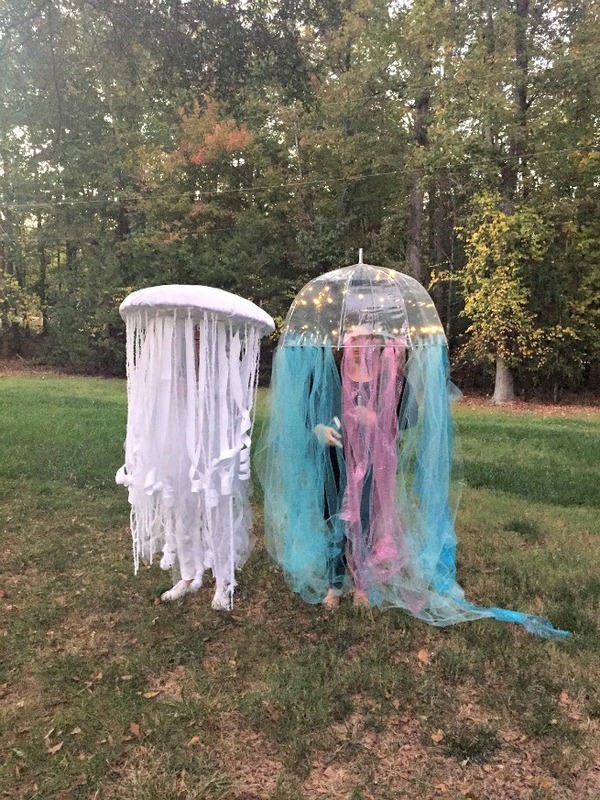 Your costume is SO great! And the Blue Ivy costume, hahaha. Y'all are freakin' hilarious. Yay for Halloween and fun times!! 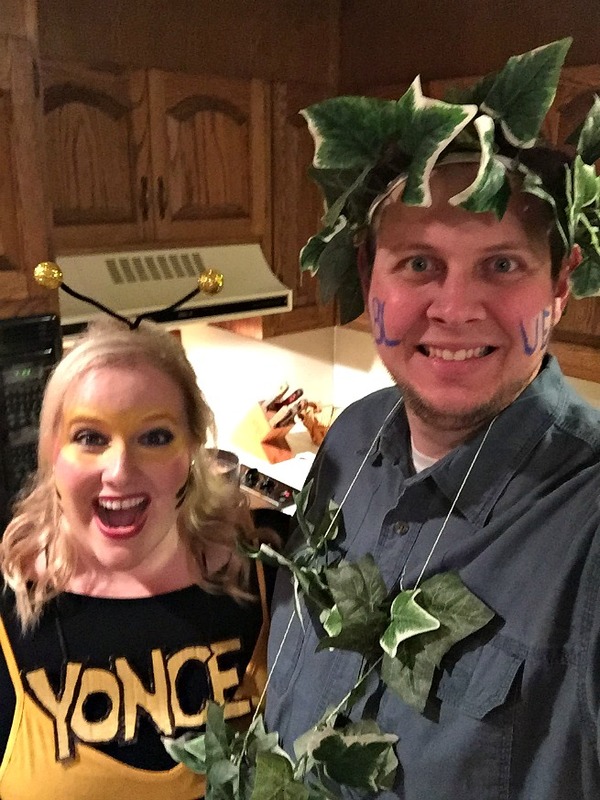 BEE-Yonce plus Blue Ivy is SUCH a creative costume. I absolutely applaud you for this!